We had a second meetup around Google I/O, focusing on all the relevant news and content presented at this conference. See these slides to get links to Google I/O talks, grouped by topic - from Android till TensorFlow. Then Emanuel gave us a more in-depth presentation about Android Things - see his slides with his hands-on experience with the kit from I/O 2017. We were hosting again a Google I/O Extended this year. About 70 participants joined us in watching the event live with thousands of other developers worldwide. And more will be announced at I/O 2017. All of them we will cover in our next meeetup! 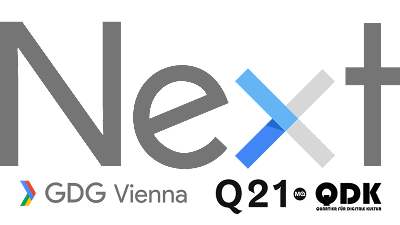 Cloud Next '17 had many great announcements, and one of them was that Google Cloud Functions are now in Open Beta. In a short overview presentation we were discussing what Google Cloud Functions are, how they are invocated and their pricing. In addition to triggers like HTTP or Google Pub/Sub, there is also the possibility to link them to Firebase. 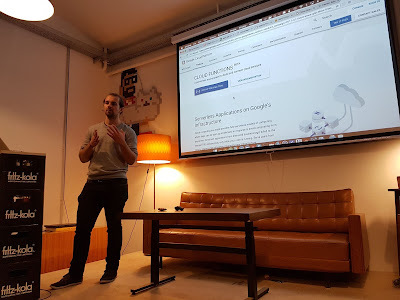 In the second presentation László - a member of GDG Vienna but also organizer of Serverless Vienna meetup group - showcased using Cloud Functions together with Firebase, including a review of the developer experience. And finally Nik Graf talked about the big picture in his presentation: what is serverless, what offerings exist from Amazon in comparison, and how does the "Serverless Framework" help to abstract the differences in the vendor-specific configuration. Looking forward to seeing many of you at our I/O Extended! We were watching together the Cloud Next '17 keynote of day 2 (infrastructure & technical announcements) in Raum D / Quartier21 (Museumsquartier). At the end we raffled three tickets for WeAreDevelopers, which takes place on 11-12 May 2017. Congratulations to Christian, Rebecca & Willy! For everybody else: use the code GDGVIENNA20 for a 20% discount off the current price. And our next events are already planned. On Saturday 11 March we have Women Techmakers Vienna - Telling Our Story, and on 26 April we will have a deep-dive into some of the news from Next '17: Cloud Functions & Cloud Functions for Firebase, going serverless with Google. We were meeting for a viewing party of the keynote and the first couple of sessions from the TensorFlow Dev Summit 2017. A mixed audience, some already working with TensorFlow and others more interested in it, we learned about the release of TensorFlow 1.0, including the tf.keras module, offering compatibility with Keras, another popular high-level neural networks library. On 9 March we have another viewing party (Next '17 Extended - Vienna), this time it's all about Google Cloud. On 11 March Women Techmakers Vienna takes place - register on Eventbrite (and it's open for everybody, not just women!). 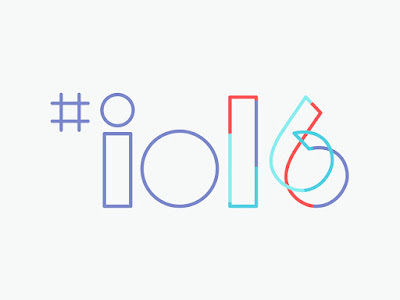 And of course as every year we will have a Google I/O Extended Vienna, this time on 17 May. Thanks again for this awesome meetup and looking forward to seeing many of you soon again! Our first meetup in 2017 was again in the Google office in Vienna. A big Thank You to Google for the room, drinks & snacks! We started with a "What's New at Google" slideshow - a collection of developer related stuff recently announced or made available by Google. Android Things, Flutter developer experience, Grumpy and more stuff have been mentioned there. In the main presentation we were talking about developing with API.AI as well as using the Actions SDK, including a live demonstration of the agend on Google Home. And then we were talking about our plans for the future. We will have a Next '17 Extended - Vienna event on 9 March, a Women Techmakers Vienna event on 11 March, and Google I/O Extended Vienna on 17 May. Thanks to everyone for coming and making this such a great meetup! Join us for a wrap-up of Google I/O 2016 - directly from participants who were on-site this event. We will share our impressions, a few pictures around the event, and discuss about the highlights of this year's Google I/O. In addition Robert Kubis - Developer Advocate at Google - will give a talk about the Google Cloud Platform.